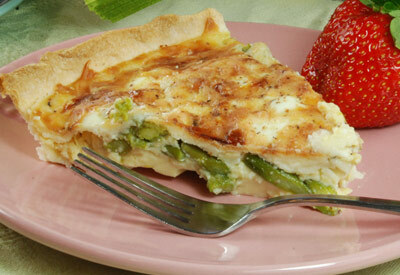 Sprinkle cheese in bottom of pie shell covering dough. Arrange asparagus over cheese. Add eggs to mixing bowl and beat slightly. Add enough milk to evaporated milk to make 2 cups. Combine with eggs, salt, pepper and nutmeg mixing well. Pour over asparagus in pie shell. Bake for 45 minutes or until knife inserted in center comes out clean. Cool 10 minutes before serving. *Blanching is a cooking process where the food, usually a vegetable or fruit, is plunged into boiling water, removed after a very, very brief time and immediately plunged into ice water. The ice water halts the cooking process and preserves the color. Food is blanched to soften food, partially cook food or to remove a strong flavor.